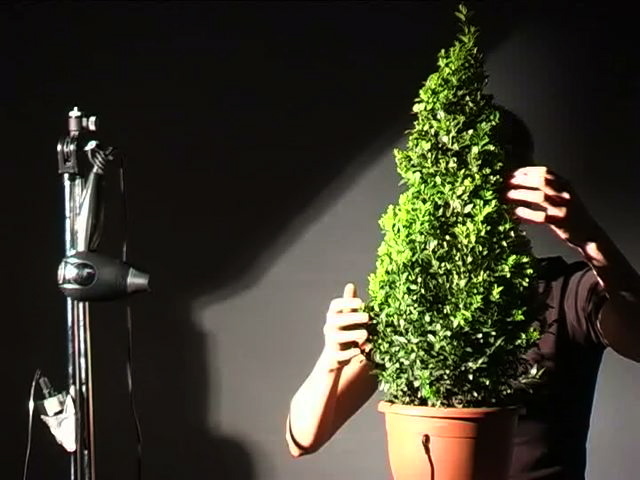 This performance takes two simple every day objects–a plant and a hair dryer–to investigate in our relationship with our “natural” environment. Looking for transitions between human, plants and machines, the story of the nymph Daphne, who transforms herself into a tree is taken as a starting point. Electronic processing of the sounds as well as visual gestures transform the tree into a human being and the sound of the hair dryer into a big storm. By exploring these typical categories of human, nature and machine objects, the borders start to blur. The tree is played by using contact microphones as a control interface for electronic sounds as well as live processing with MaxMSP.